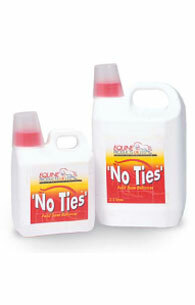 Equine Products UK No Ties has been specially formulated to support the maintainance of healthy muscles in working, racing and highly active horses. No Ties helps support the balance of acid levels in the body and targets the build up of lactic acid. Trisodium citrate, Citric acid, Carbohydrates. Add 80ml to the evening feed. An additional 30ml should be fed post-competition in the drinking water. The product may be poured onto the feed or administered directly into the horse’s mouth. There are currently no questions for Equine Products UK No Ties for Horses - be the first to ask one!